This Chart presents in beautiful colors a complete panorama view of - both the past and the future - ALL ON ONE CHART. It starts in eternity past, and takes you on a step by step visual journey to understand the bible better as you go through the entire Bible and each of the major ages in God's master plan. Beginning in Genesis and on to Revelation it depicts the beginning - on to the Age of Innocence and continues onward to the Millennial Kingdom and beyond, into eternity to the New Heaven and New Earth. 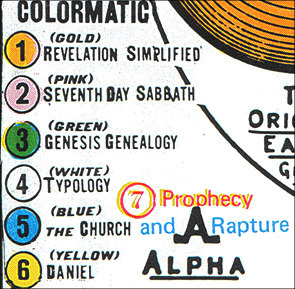 Based on the legendary drawings of Clarence Larkin, this chart has been used by Bible schools teachers for many years, every event on the Chart has a Bible study scripture reference listed. Simple and easy to understand the Chart measures 12 inches tall by 36 inches and is made of YUPO, a premium synthetic waterproof material that will not tear. Students and laypersons alike can gain an easy understanding of major issues and themes in the Bible from this treasured, study, teaching and pastor reference resource. The Chart is color coded, corresponding with the book colors of book titles you can order that corresponds with the colors on the chart. See a close-up view HERE. It has been said "If there was an Academy Award for Bible Charts, this would win the Oscar"